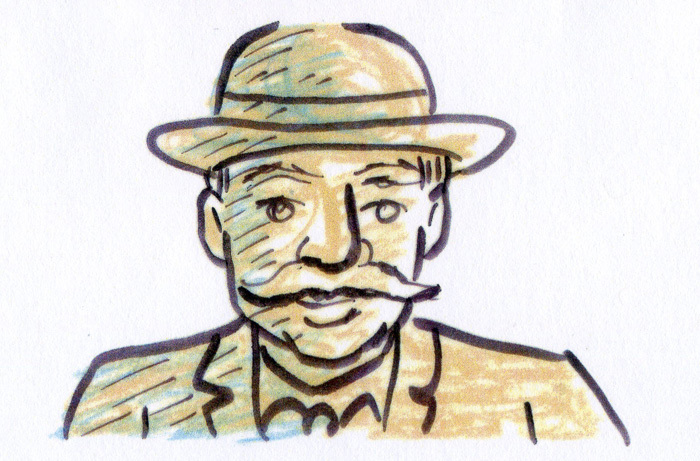 Ah, yes, “Wax on, wax off!” That brings thoughts of Danielson and Mr. Miyagi from “The Karate Kid.” That kind of intense training is what I got from master cartoonist Frank Santoro. 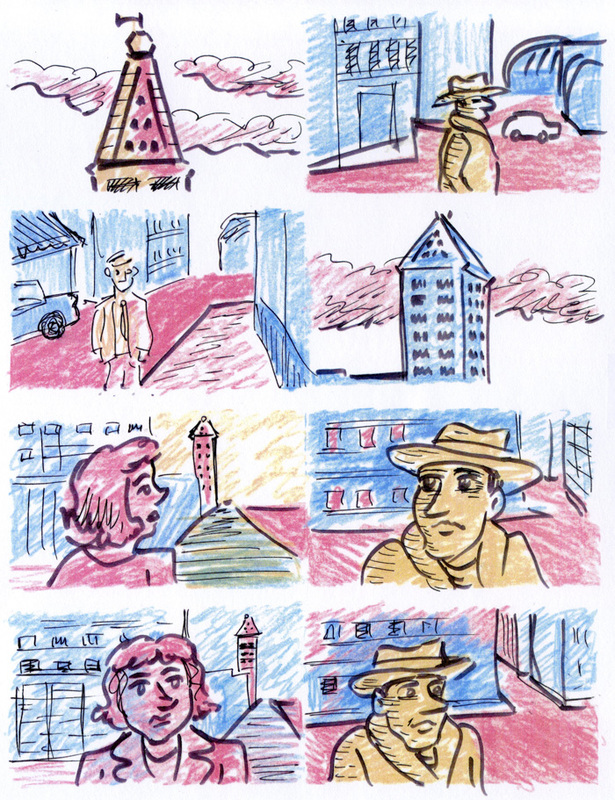 “Smith Tower” is the result of my being a pupil of Frank Santoro, author of the landmark graphic novel, “Storeyville,” and the recent critically acclaimed, “Pompeii.” I had the privilege of taking his course in comics. It is not for the faint of heart. It requires a special set of skills going in and a determination to see your goals through. It is akin to the spirit behind a 24-hour comic session, although this course lasts considerably longer. It involves a lot of drawing. And it is all about structure. You gain a greater appreciation for all the framework behind a work in comics. It’s about geometry, pacing, color, storytelling, and purpose. Those that do well in the course, I believe, already have stories to tell and already have methods in place to tell them. I mean, I already have a pretty hefty portfolio of my own work in comics. What Frank offers is a third way, an intriguing set of options, a totally innovative as well as classic approach. Ultimately, it comes down to process. You enter a comics boot camp and you come out better equipped to for the long haul ahead. Art. Writing. Comics. It’s all a long haul strategy, if you hope to achieve anything meaningful. Each project leads to the next. And each project is important in its own right. 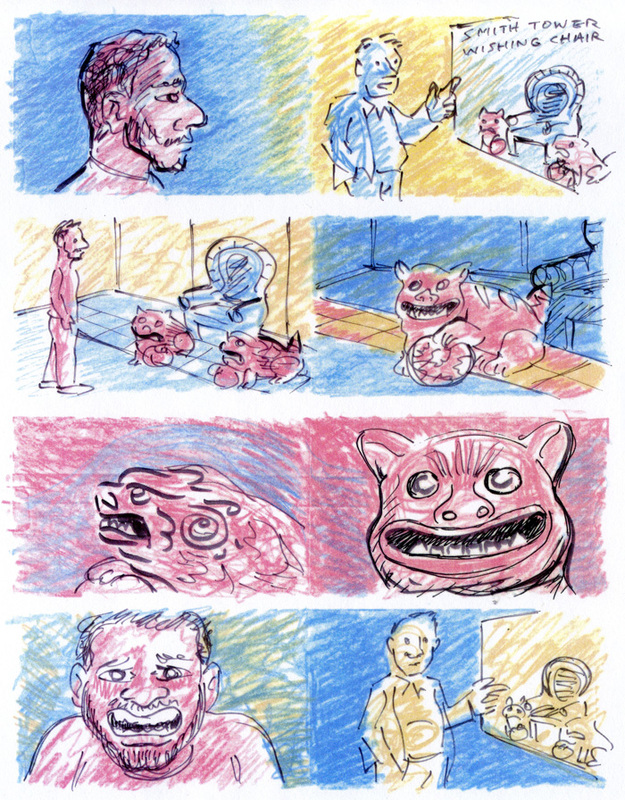 What I see with this latest minicomic is something special indeed. It is part of a bigger work and yet holds it own as one set piece. What I find special is that I am working with some building blocks that have really taken hold. These are magic building blocks working their way through my mind, being set down on paper, in whatever irrational random order they initially come out, and then they reorder themselves a number of times until we reach a level of clarity, of specificity that we can work with. What is so great about the course is that, as you navigate your way through it, you really cannot help but give yourself over to it. Whatever initial plans you had for your project are subject to the flow of the course. Process takes over. You are working without expectation, boundaries, or limitations. Draw! Draw! Draw! That is the call to action. The secret, for the student, is all in the pacing. Have your goals in place, flexible yet determined. When you draw, draw with vigor! Be ready to strike! Lay it out as you go. You just never know if some of those first marks could turn out to be essential guideposts. You are whacking through the jungle with your machete in order to come back later with a knife and then a scalpel. I chose an urban jungle as my broad theme and began to clear a path. I knew right from the start that I needed to marry some ideas I’ve been working with for a longer piece. I wanted to see how they’d mix and mingle when placed in a new stimulating arena. What would happen if I let loose some characters I had penned up into one of the scenarios I had been stewing? What would happen if I gave myself over to the process? Well, that’s what happened during the course and this minicomic is the result. 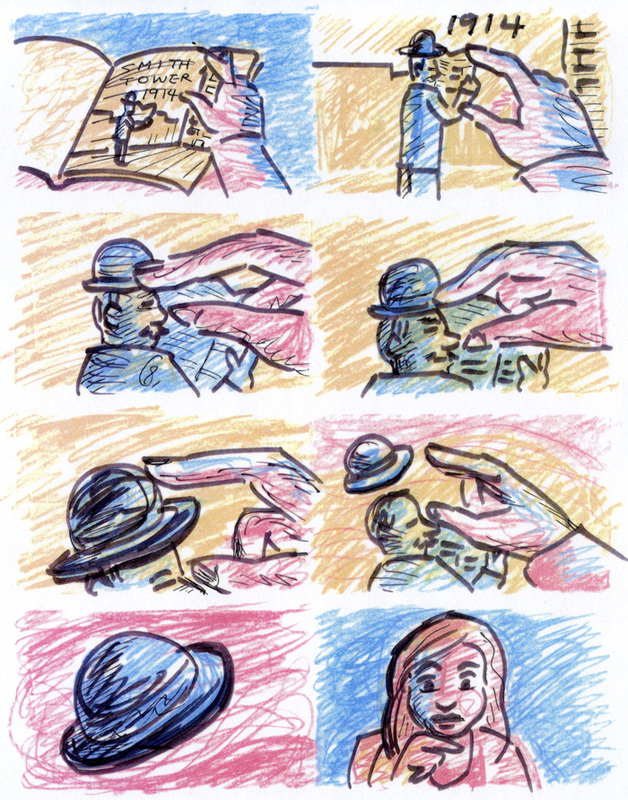 It is a process of layers: storyboarding, editing, more storyboarding, color choices, more editing. What I hope comes across is the organic process. As an essential participant, you the reader, play a critical role. I hope that the young woman, Annie, comes into focus. And I hope you get a sense of her struggle amid the overall tension. And I hope the supernatural elements read well. I hope they evoke a longing for meaning. Everything revolves around Smith Tower. People leave their mark. People come and go, like the women who come and go, talking of Michelangelo. Smith Tower remains. But people still leave their mark. 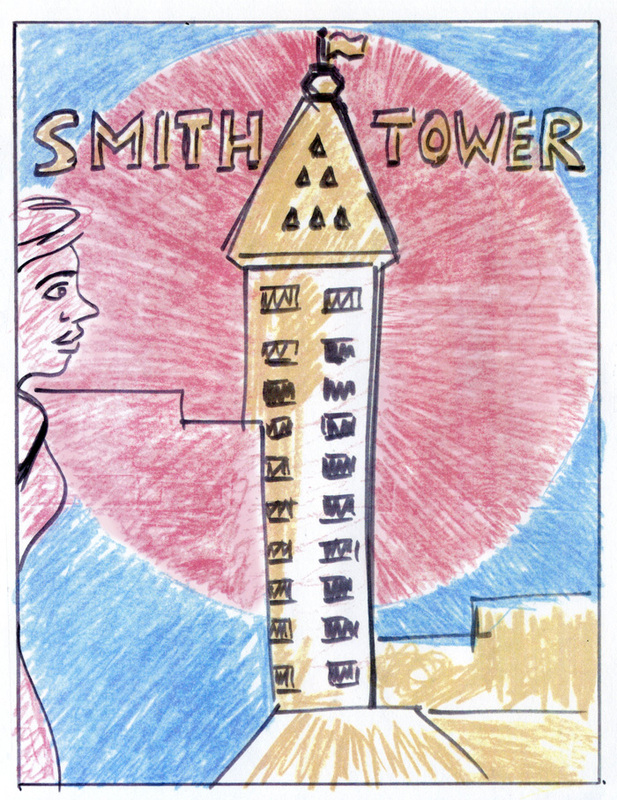 “Smith Tower” is a 16-page full color minicomic, 8.5 x 7. Print copies are available as a reward during my GoFundMe campaign right here.